Hi everyone! We have another super exciting major set of updates to announce for this month. As we continue to improve the Wonderware Online experience, we felt that it was important to give users a better sense of navigation across the clients of Wonderware Online and throughout the browser interface itself. 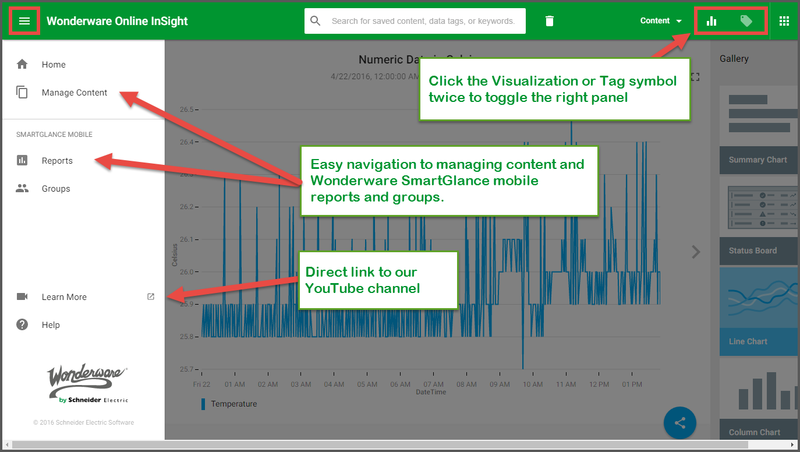 Therefore in this release, we added a unique name to the browser client which you can now easily see branded as Wonderware Online InSight and displayed prominently both in the header and on the main landing page. The browser client Wonderware Online InSight, as part of the Wonderware Online offering from a branding perspective now better complements the full suite of clients available for Wonderware Online, which of course includes our easy to use native industrial mobile apps, Wonderware SmartGlance and of course the traditional on-premises Historian Trend Client. Within Wonderware Online InSight, we've also added some navigational buttons to help you quickly return to the welcome landing page or to jump to important management and user profile areas of the portal. 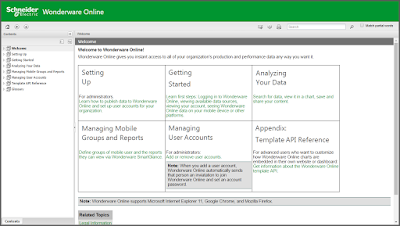 The newly branded browser client - Wonderware Online InSight. Also shown in the top right-corner are the new navigational buttons. Highlights of some of the new design updates. New profile silhouette with a direct link to the Wonderware Info Blog. This "newsfeed" is a very exciting new feature that will automatically analyze all of your incoming industrial data and then automatically detect any anomalous data patterns. We summarize those anomaly detections right on the landing page of Wonderware Online InSight signaling to users data trends and patterns that might need further investigation and analysis. The greatest part of this feature is that it is completely automatic and automated. There is nothing required to get it going nor is any configuration needed - it just works for you immediately. As more data becomes available, the more refined its ability to detect anomaly's become. It only gets better over time. 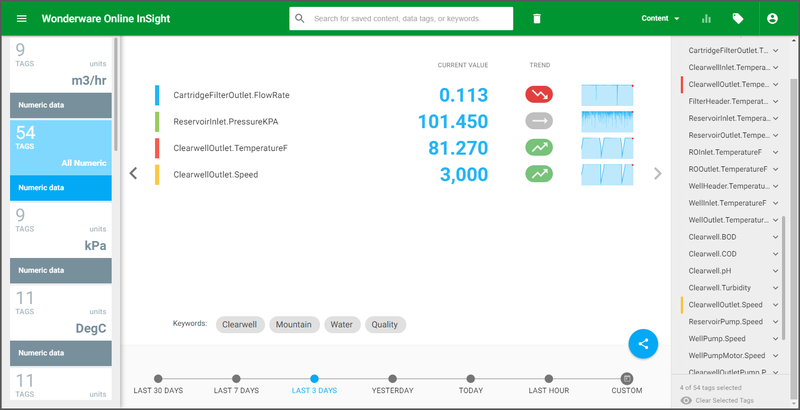 Examples of the industrial newsfeed feature in action highlighting changes to data patterns. You gave us feedback, we listened! Nothing is more satisfying then seeing an update that many of you had directly asked for. Previously, we grouped tags by default based on their engineering units but now we offer a new data group called "All Numeric" which as you might have guessed, finally allows you to plot multiple engineering units on the same graph. For example, let's say we wanted to plot temperature and humidity on the same graph for additional context. Previously this was not possible because one data point was based on degrees while the other was based on percentage (% relative humidity). Now you can select the "All Numeric" data group to see all numerical tags available to your chart canvas and combine multiple engineering units together for added context on one single chart. Example status dashboard with multiple data points with multiple engineering units. 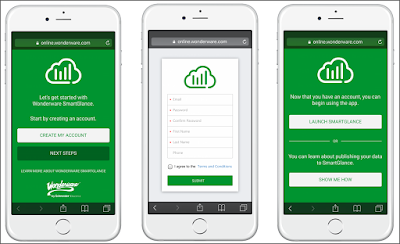 For our iOS mobile users looking to sign up, we require them to visit the Wonderware Online website at https://online.wonderware.com to register. 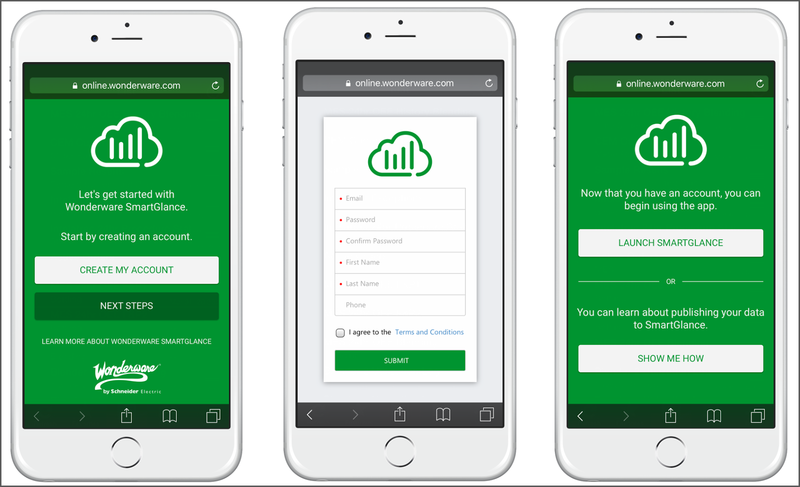 Now we have optimized the browser experience for mobile devices so that customers can register directly from their mobile browsers and then proceed to directly download, launch and log in to their Wonderware SmartGlance mobile app. New Wonderware SmartGlance mobile optimized registration screens. 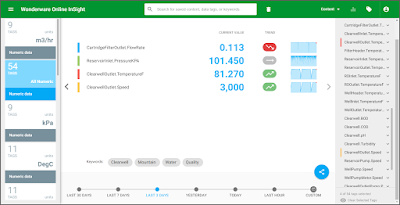 Just a quick note here to let everyone know that under the hood, the teams have been working hard to vastly improve the performance experience when using Wonderware Online overall and including the responsiveness of the Wonderware Online InSight browser client. This April release benefits from a lot of focused efforts around performance and we hope you feel the difference. Let us know if you aren't getting the full effect. 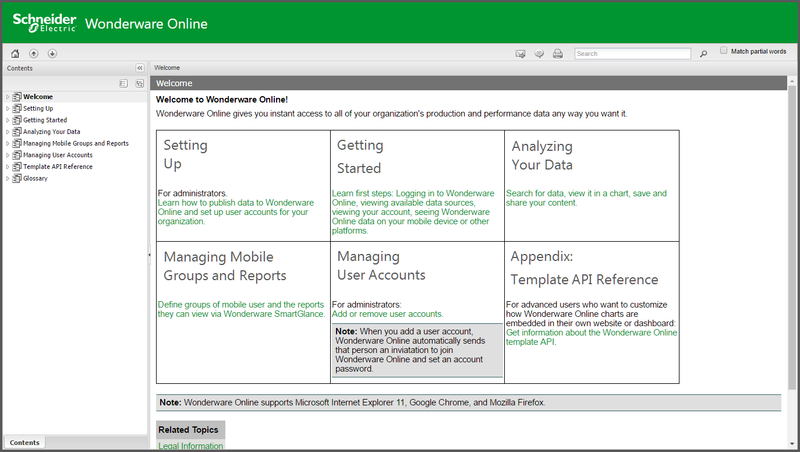 This is just a reminder that Wonderware Online as a whole has easily accessible online living help documentation always available at https://online.wonderware.com/help. A log in is not even required to access the documentation. If you ever have any questions or comments about the features or functionality of Wonderware Online from publishing, to storage, to retrieval, to mobile alerts, to exporting data and finally to directly querying our secure, authenticated REST APIs - please take a look at the documentation as your first step to getting answers. If you still can't find what you are looking for, you can always write to us at feedback at wonderware dot com. Rich online documentation available at https://online.wonderware.com/help. By the way, have you ever thought of sharing your corporate info via online data room ? It is a new cloud technology, very safe and convenient.